Plug-in > v2.0.0 works on Joomla 3.x with Virtuemart 3.x and Joomla 2.5 with Virtuemart 2.0 or Virtuemart 2.6! Install plugin with Extension Manager in Joomla and enable it in Plug-in Manager. 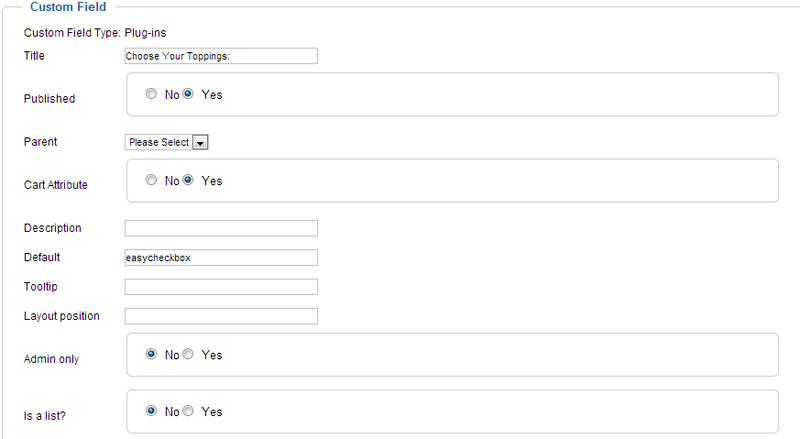 Then go to VirtueMart and configure plug-in in Custom Fields page. Choose New and then at Custom Field Type choose Plug-ins. Type Title and at Select a plug-in choose VM - Custom - Easycheckbox. You can here type default additives. Then go to product and go to Custom Fields tab. At Custom Fields Type choose plug-in which you created. Now you can type Title, Selections and choose if you want that plug-in is shown in two columns. 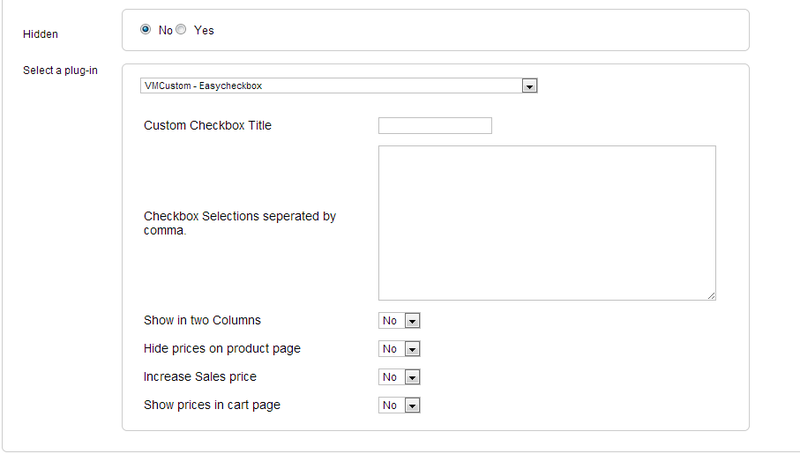 Custom title - Unlike Title in custom field section, which is shown in add to cart area as title, Custom title is shown in cart page. Show in two columns - Show checkboxes in one or two columns. Hide prices on product page - If checked, price variants are hidden in checkboxes labels. Show prices in cart page - This shows checkboxes descriptions and prices in cart page below product name.